Disney on the Brain: And Now for Something Completely Different: Guest Blogger! And Now for Something Completely Different: Guest Blogger! SO I saw Wall-E on Friday when it came out, so I was going to blog on that, besides a post about the new monorails at Disneyland, but my time to do things has suddenly been schedualed, and blogging happens to not be one of them right now. So normally you wouldn't be reading anything right now, but luckyly my sister has asked me if she can do a guest post. I was planning on posting this later after I had the time to read it, but I figured you guys needed something. So, Without further ado, a guest post! Hey everyone! Rikua's sister here. Yes, I'm the one that works as a CM (that's Cast Member for those of you who aren't in the know) at Walt Disney World. This is the point where I would normally tell you more about myself, but I'll just skip over that right now. If I'm lucky, you'll really like this post and then Rikua will ask me back (so there!). So if you enjoy this, leave him a comment and tell him so. Walt Disney's Carousel of Progress! 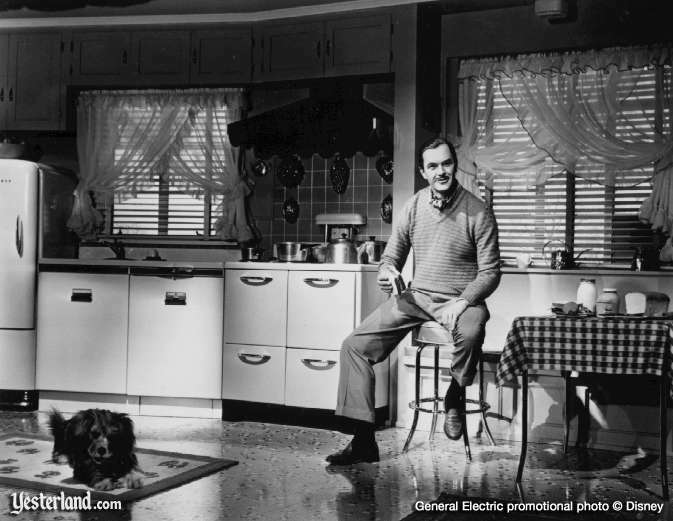 For those of you who aren't familiar with the Carousel of Progress, this was one of the last attraction that Walt Disney personally saw to completion. Along with It's a Small World, the ride made it's debut at the 1964 New York World's fair. The ride originally was sponsored by GE, so it showcased the progress of an American family through four generations, mainly through the inventiveness of electrical products. But this wasn't just show and tell for GE. Walt Disney loved the idea of the American family, it was at the base of everything he did. He was also a big fan of progress--just look at all the innovation he created in his lifetime! What better idea than to combine the two, and transplant the completed attraction back to Disneyland when the fair was over? And voila! You've got the Carousel of Progress. "Now most carousels just go ’round and ’round, without getting anywhere. But on this one, at every turn, we’ll be making progress." Every act features the family father with his faithful dog (now dubbed Rover) by his side telling the audience about the new progress his family is experiencing. Additional family members occasionally pop in to add their two cents, so keep an eye out for Mother Sarah, Grandma, Grandpa, Patty, the (unnamed) little brother, and Uncle Orville. As you can see, the only thing that this last scene and the show as it currently stand have in common is probably the fact that they both happen during Christmastime. That's progress for you! 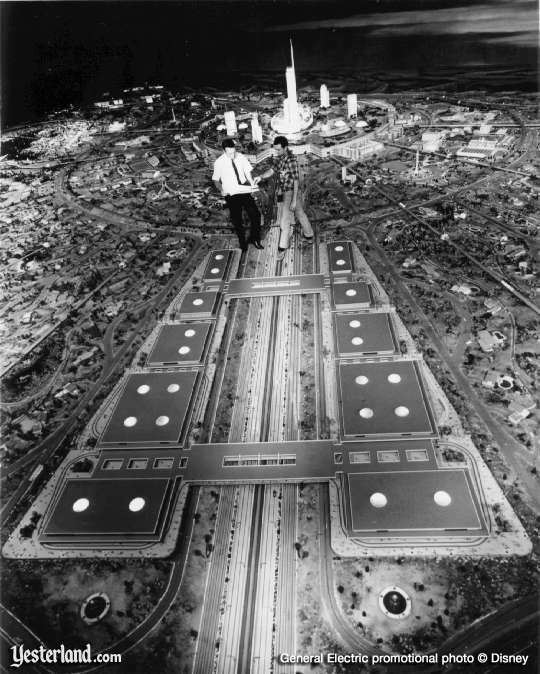 Walt's eventually had a plan to build his own progress city, a place that he dubbed EPCOT (Experiment Prototype Community of Tomorrow). 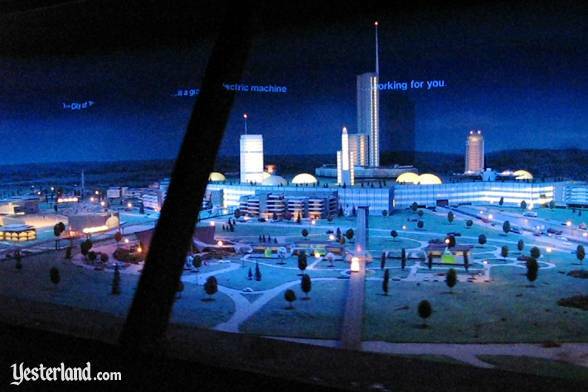 The actual model of Progress City didn't have the two Imagineers present, but it is assumed that they are included in this publicity photo for scaling purposes. 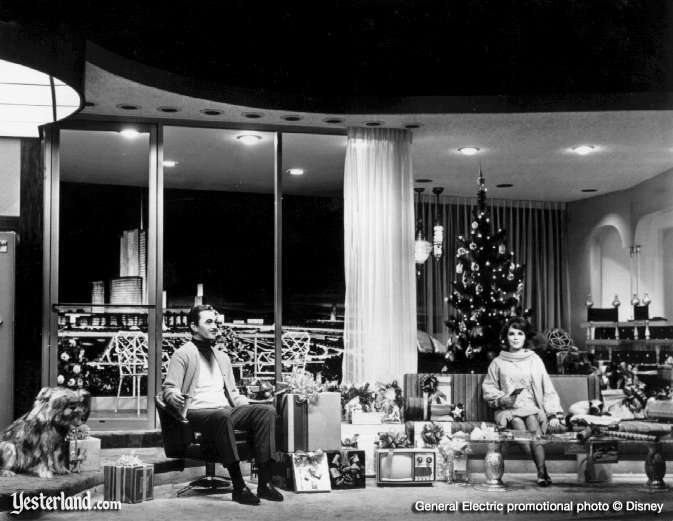 After a run of six years, the Carousel of Progress was permanently closed at Disneyland in 1973. But this isn't the end of the story. Oh no. 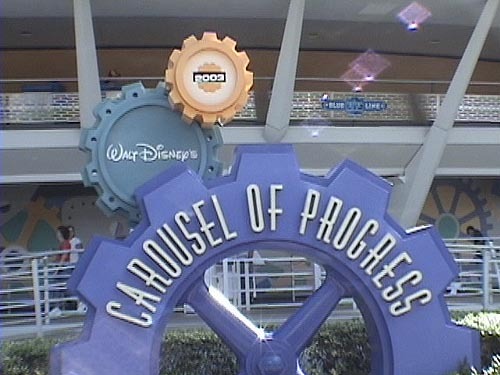 Because the Carousel of Progress is still around today... but in Walt Disney World. Perhaps you'd like to know the reason the ride was moved? According to Disney sources (I got this from a guy in Imagineering, so he should know), it was the decision of the sponsor to move. As I mentioned earlier, the ride was sponsored by General Electric. With the opening of the Magic Kingdom in Florida in 1971, GE was big on the idea of having a whole new audience that hadn't been tapped into. Their idea was that the ride served as one big commercial for GE products and how they helped the family progress into the future. 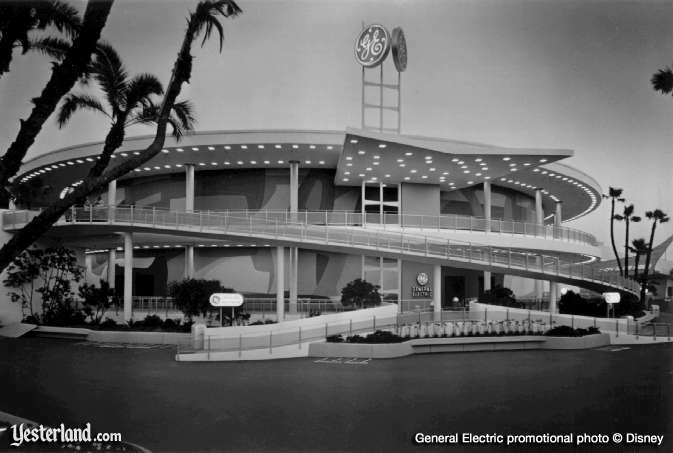 So by 1975, the Carousel had moved to Florida at GE's insistence. Now this is where it gets interesting. Most people easily recognize the ride theme song, "There's a Great Big Beautiful Tomorrow," but that wasn't always the song! With the move to MK in 1975, GE asked the song to be changed. They wanted the focus to not be on the future but how GE could help you have a beautiful now. The Sherman brothers (the original composers, and the genius behind such songs as those found in Mary Poppins) reluctantly agreed to write a new theme, and the ride was redone with the song "The Best Time of Your Life." The whole point was to focus on the fact that the best time is now, and it's all possible with products from GE. You can still hear a variation of this song in the Tomorrowland background music at the Magic Kingdom if you listen carefully. But here's the best part. The Sherman brothers were never happy about changing the theme, since "A Great Big Beautiful Tomorrow" was a song that they wrote for Walt. With the extensive re-theme of Tomorrowland in 1994, the attraction was changed back to the original theme song. Why the change? GE is no longer a sponsor! So Imagineers decided to put the ride back the way it was intended. It was also dubbed Walt Disney's Carousel of Progress, and given a very nostalgic feel to it. Although GE no longer sponsors the ride, if you watch carefully, you'll notice their logo on several of the new appliances. So you're probably wondering just what happened to that building at Disneyland. Well, from 1974 to 1988 it was the home of the attraction America Sings. Eventually the top level was converted to become the Super Speed Tunnel for the Peoplemover attraction, while the bottom was still used as the theater. With the end of America Sings, the bottom just became used as office space for several years (how much of a waste is that!). However, with Disneyland's Tomorrowland renovation in 1998, it was finally converted to Innoventions, once again using the two level design. Although it doesn't really resemble the theater it used to be at all, the carousel building still spins as a tribute to the great ride that previously was housed there. And here's a quick bit of Hidden Disney for you. In Tomorrowland at the Magic Kingdom, behind the fast food station located underneath the TTA, you'll find a payphone. If you push button number 9, you'll hear a recording that pays homage to both theme songs of the Carousel of Progress. I won't spoil the surprise here, but pay close attention and you'll definitely get it. And here's a treat for those of you who've never seen the carousel. Yep, it's a YouTube video of the attraction. Can you really avoid these when talking about the parks? Sadly, the carousel is struggling. With almost a 60 year gap between Act 3 and Act 4, it's become harder and harder to keep the ride up to date. Since 2001, the ride has been on and off of theme park maps and will even remain closed for long periods of time. So if you are at Magic Kingdom during a busy time and it's open, you may want to catch it while you still can. It may not be long before the Carousel sees it's last tomorrow. Before I go, I want to thank Yesterland for the use of these photographs (though I'm sure you already saw the logo on them). Also, if you'd like to find out more information about the Carousel, check out the section on it in the Imagineering Field Guide to the Magic Kingdom at Walt Disney World . Also, if you are interested in seeing all sort of some of the "Hidden Disney" details like those I mentioned, 101 Things You Never Knew About Walt Disney World: An Unauthorized Look at Tributes, Little Touches, And Inside Jokes might be a good fit for you.